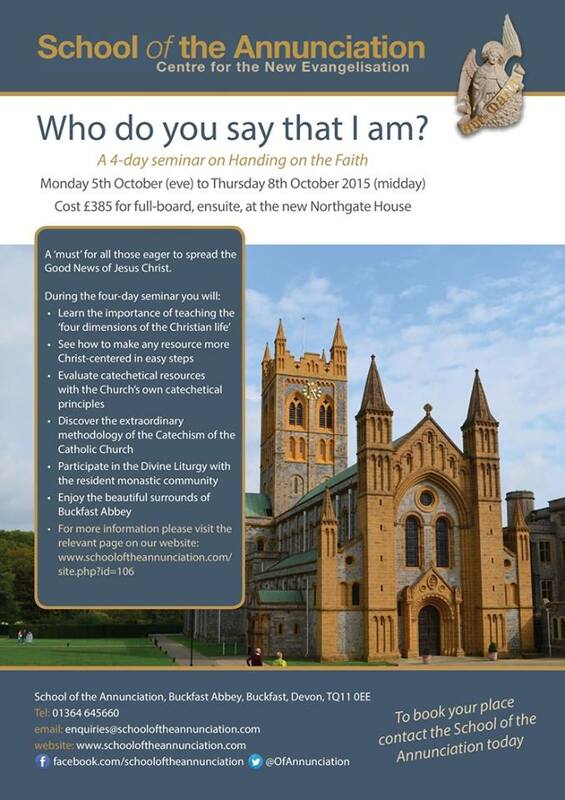 The School of the Annunciation is holding a seminar from the evening of Monday 5th October to lunchtime on Thursday 8th October 2015 on the subject of the New Evangelization and the Catechism of the Catholic Church. Fr Guy de Gaynesford will be a key speaker at this conference, along with Dr Caroline Farey, his eminent colleague at the School, amongst others. The title ‘Who do you say that I am?’ is the question asked by Our Lord of his disciples in St Mark’s Gospel. This question still resonates through the centuries. We thought our listeners would like to be reminded of one of Fr Guy’s homilies of some years ago when he speaks on this passage. so we give it to you again below! More details of the conference are available via this link.